2019 Race Grid and Schedule is now posted! The Arizona Dragon Boat Association would like to extend a warm welcome to teams from all over the world to our 16th Annual Dragon Boat Festival to be held March 30 & 31, 2019 on our beautiful Tempe Town Lake! We offer 10 Divisions: Mixed | Women | Open | Collegiate | Corporate | Masters | BCS | Adaptive or Disabled Athletes | Youth | High School. Additionally, we also offer our “Guts & Glory” and “Knock Out” races, with limited availability. Proceeds for the “Guts & Glory” and “Knock Out” races go to support the AZ Disabled Sports organization. 2019 REGISTRATION IS NOW OPEN! CLICK HERE TO REGISTER YOUR TEAM | DON’T MISS OUT ON THE EARLY BIRD RATES! Note: Early Bird Rates have now been extended to February 8th! Paddlers must be at least 14 years old to race, with the exception of the Youth Division (8 – 14 years old), Junior Division (< 18 yrs old), and High School (no age restrictions). Mixed teams must have a minimum of 8 male and 8 female paddlers (other 4 can be either). Women’s teams must be female and have a minimum of 16 paddlers, however there are no gender requirements for steersperson or drummer. Open teams must have a minimum of 16 paddlers. Collegiate, Corporate and Masters must have a minimum of 16 paddlers, 8 of which must be female. BCS teams must have a minimum of 16 paddlers, all of which must be breast cancer survivors or female cancer survivors. There is no BCS requirement for the steersperson or drummer. Youth and High School Divisions have no gender restrictions but must have a minimum of 16 paddlers. We allow a maximum roster of 25 team members and therefore, will only be providing 25 medals per winning team. Out-of-town team practices will be on Friday, 03/29/19. We will require all teams to sign waiver forms and deliver them to the practice coordinator(s). All team(s) must comply to all of the Tempe Town Lake’s rules at the practices, the practice coordinator will review this information with your steers. Are you interested in being an event volunteer? See the section below for more information. Dragon boating provides the ultimate team building platform to boost morale while promoting key abilities essential in a work environment. Dragon boat racing is an exhilarating and addictive sport that requires communication and team work to be successful. Rhythm, discipline and focus are just a few characteristics important to this awesome sport. 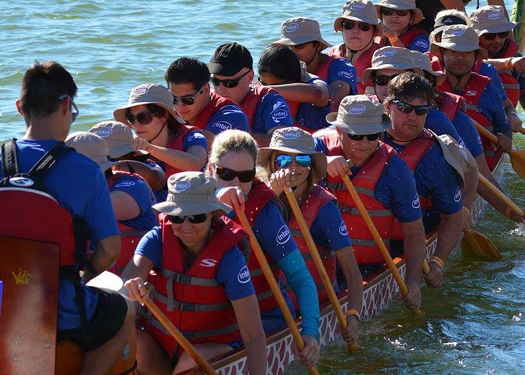 Our annual Arizona Dragon Boat Festival offers an opportunity for local and regional businesses and organizations to join in the fun. We had another record year for participants in 2018 and look forward to more great teams to join in 2019! Compete with companies like Mayo Clinic, Wells Fargo, SRP, Intel, AT&T and many more. We make it easy to participate, and the best part is – no experience is necessary. We’ll provide you with everything you need, including equipment, practice time AND a qualified coach! If you are still hesitating because of lack of confidence, there’s even more help! We’ve developed a New Corporate Dragon Boat Captain’s Starter Kit just for you. It has everything you need in order to field a successful Dragon Boat Crew in our festival for the very first time! We provide you guidance on funding your team, recruiting tips, putting together a roster, and lots of logistical tips on planning out everything from the practices all the way through race weekend! Download the Captain’s Starter Kit now! Register your Corporate team NOW! 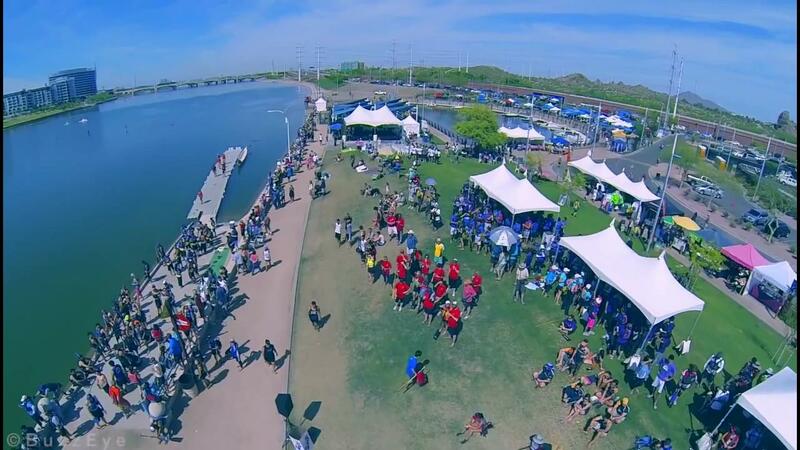 The Arizona Dragon Boat Festival has over 2000 paddlers from all over the country attending to compete. With that many attendees, we require a full staff of volunteers to help with the days’ business – from set-up and parking to staging crew and dock hands – we have to fill all the roles! 2) Review the options listed and choose the spot(s) you like. Note: We do not share your email address with anyone. To see all positions and to answer some of your questions download the volunteer packet. If the packet does not answer all of your questions please contact volunteers@azdba.org and someone will get back to you. The AZDBA (Arizona Dragon Boat Association) is a 501(c)(3) nonprofit organization whose primary mission and purpose is to promote the sport of dragon boating through community involvement and education for the state of Arizona. 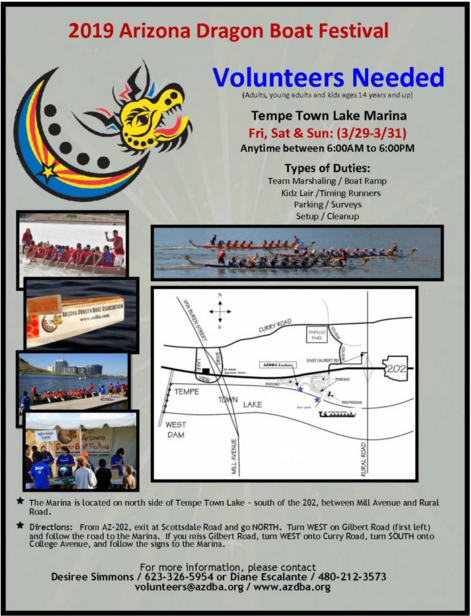 ©2016-2017 Arizona Dragon Boat Association, a 501(c)(3) Non-Profit. Websites for Non-Profits.